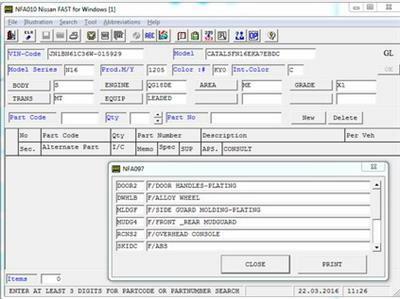 Electronic catalog of spare parts for NISSAN vehicles. The program for determining the original part number. You enter the VIN code of the car – the program "parses" it into parts, tells you the date of the car’s release and offers only those spare parts that are installed on your car. 2. We go in one mounted image in the folder \ FASTPRG \ WIN2000 \ SETUP \, run Setup.exe and specify the installation path. From the second image, this operation is no longer necessary. 4. Next, go to the folder C: \ NISSAN and run the file Nfset.exe. 5. After startup, click on the CD-ROM SETUP tab and specify the path to our folders. 7. We launch the Nissan Fast and use it for health. How to check the VIN car NISSAN, INFINITI or DATSUN without this directory or easily determine the section of the directory in which to search for this car.